"I only wish I'd never before used the words 'breakthrough' or 'breathtaking' or 'magisterial' or 'stunning achievement' or 'your world will never be the same after you read this book.' Then I could be using them for the first and only time as I describe my reaction to Daniel Coyle's The Talent Code. I am even willing to 'guarantee' that you will not read a more important and useful book in 2009, or pretty much any other year. And if all that's not enough, it's also 'a helluva good read'"
Daniel Coyle is a two-time National Magazine Award finalist and a contributing editor to Outside magazine. He has written for the New York Times magazine and Sports Illustrated. His previous books include The Times bestseller Lance Armstrong:Tour de Force, which won Best Biography in the 2006 British Sports Book Awards. 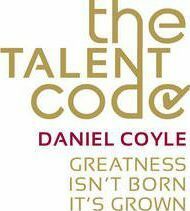 He first wrote about the idea of a talent code in a March 2007 article for Play. He lives in Alaska.